Our journey to discover natural beauty brands continues, and this time we went out to the West Coast - San Francisco. 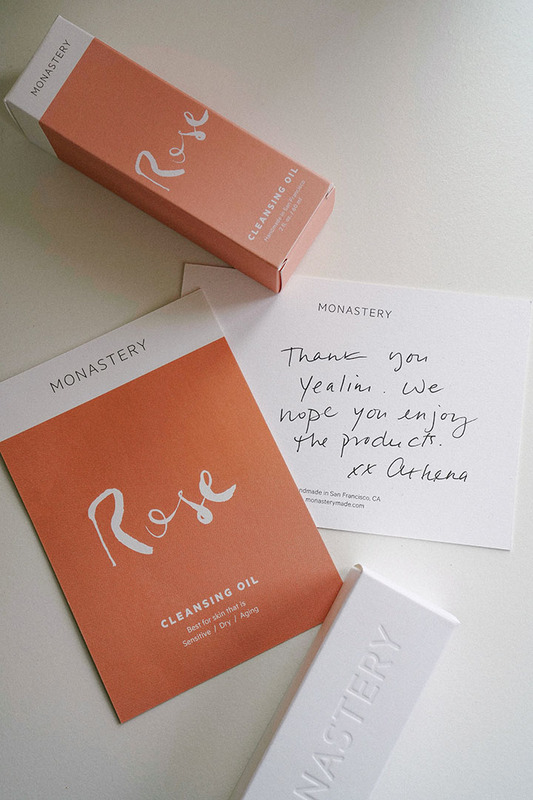 Sadly, we couldn't physically be there this time to interview them, but we got lucky to get a chance to interview the San Francisco-based Esthetician and Monastery Skincare Founder, Athena Hewett. Here are some questions we asked, and Athena answered. Athena: Estheticians provide skin health for their clients through facials and at-home skin care recommendations. Athena: Skincare products were always something that I had a great interest in. My family had an olive orchard in Greece and supplied their oil to a local skincare company so the idea of taking care of one's skin was something I was familiar with even as a small child. What is your daily routines of skincare? (morning/night) Teach us how to have healthy skin! Athena: I believe in the less is more approach. As an esthetician who has been in the business for a really long time, I feel like I have seen it all. For my skin type,( dry and sensitive) a routine consisting of products made of oil works for me. I use my own Rose Cleansing oil at night and that's it. In the morning I use the Gold healing serum, let it soak in and go about some errands around the house and then I pat some Attar repair concentrate on and follow up with a zinc cream that I made. Athena: It's not easy but there is a lot of joy involved, so it makes it ok. The answer in truth is that I can only manage it because of my husband. We are both working on Monastery full time and also taking care of our son. My son still takes naps throughout the day so that helps. We just work really hard while he is napping! We also happen to work around the clock. I think every business owner does. What are the best foods/sleep hacks/ingredients for your skin? Athena: Carrots and cod liver oil are really great for the skin, but you can't eat too many carrots or you will literally turn orange. Cod liver oil comes in a gel cap, so that makes it easier. Sleep on your back, like a monk if you can. Sleeping on your face is not good. Red Raspberry seed is one of the most amazing ingredients that I have come across. I like how you used the word "Botanical Skincare" to describe your brand. What part of your brand stands out the most from all the Organic Products out there? Athena: I'm not sure exactly. Maybe because for me it truly is a passion project. I worked really hard on the line for nearly ten years before I launched it but I enjoyed every minute of those ten years. We also take great care in where we source our botanical ingredients. We get our oils straight from the farmer. That's pretty rare I think. What type of nature inspires you the most? Athena: That's such a tough question since all of nature inspires me but the nature that I absolutely couldn't live without would probably be the ocean. What is your favorite product you've created, and why? Athena: hmmmm...... I would have to say the Rose Cleansing Oil because it was the first product that I started to develop and is a main reason that Monastery exists. The Rose cleansing oil went through nearly 100 different recipes before I landed on the one that exists now. Another reason it's my favorite is that I don't think my skin can't live without it! Who (what type of skin) will find most benefits from your products? Athena: I have yet to come across a skin type that wouldn't benefit from a cleansing oil, so I guess that means everyone! I always love getting feedback from acne prone skin types. So many people think that if they have oily or acneic skin they shouldn't be using oil on their face and nothing could be further from the truth! Message you want to deliver to people out there struggling with skin problems. Athena: Oil is your friend. Don't try to remove it from your face with products. Keep your protective acid mantle in tact by using an oil cleanser and you'll have a lot fewer skin issues. And also, advice you want to give for any future girl-bosses out there who dream to be in your position one day. Athena: Wow, that's so sweet. I have never thought of anyone dreaming to be in my position but I would say that the most important step in owning your own business is having perseverance. There are so many things that can be discouraging but all you have to do is find a way to keep going. Personal thoughts: Monastery's Rose Cleansing Oil cleanses your face completely but still keeps the moisture within, unlike foaming cleansers that dry out the skin after cleansing your face. My favorite part is it has the subtle, but definite, rose petal scent. I'm a huge fan of the scent of roses! Aloe Hyaluronic Gel is great to pair with the Cleansing Oil as a moisture barrier to keep your cleansed face hydrated. The best part of using Natural Beauty Products is that you know what you're putting on your skin. Big thanks to Athena for sharing her stories, and kindly answering my questions about her tips to healthier skin. Hope to visit her in person in the near future at her Clinic in SF, and experience the Botanical Skincare for myself. Cheers to healthy skin!